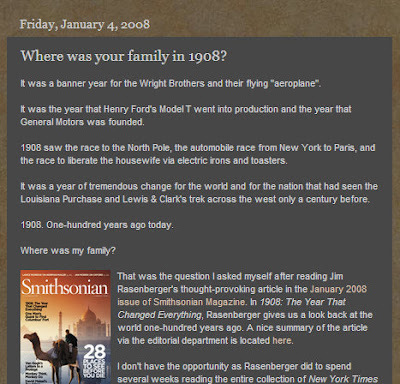 It was five years ago that my interest was sparked by Jim Rasenberger's January 2008 Smithsonian Magazine article entitled "1908: The Year that Changed Everything". "It was a banner year for the Wright Brothers and their flying 'aeroplane'. It was the year that Henry Ford's Model T went into production and the year that General Motors was founded. 1908 saw the race to the North Pole, the automobile race from New York to Paris, and the race to liberate the housewife via electric irons and toasters. It was a year of tremendous change for the world and for the nation that had seen the Louisiana Purchase and Lewis and Clark's trek across the west only a century before. 1908. One-hundred years ago today. Five years have flown for me. When I read Randy Seaver's latest Saturday Night Genealogy Fun challenge to write about the whereabouts of my ancestors one-hundred years ago in January 1913, I just had to find the time to do this exercise again. After all, this blog is called 100 Years in America! In January 1908, my great-grandparents Ferencz and Ilona Ujlaki had been an ocean apart. He had immigrated to the U.S. and was trying to establish a new life for himself in New York before his wife and young son would join him. It would be another year before Ilona and the younger Ferencz would leave their native Legrad and make the ocean voyage from the port of Rijeka to New York City. Fast forward five years to 1913. Much had changed for this little family. 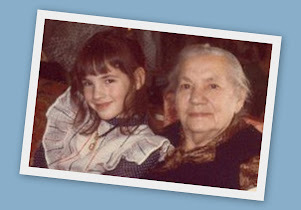 After arriving in March 1909, Ilona and her little one had been welcomed by Ferencz and settled into a tenement home in the Lower East Side of New York City. By January 1913, they probably already lived at 329 E. 16th Street, having moved a handful of blocks north from their home at 415 E. 5th Street. 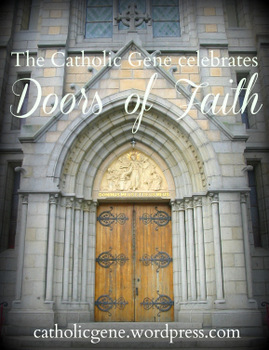 You can read more about the neighborhood they lived in and the churches they attended at Disappearing Churches, Part 1: Manhattan's Immaculate Conception and Disappearing Churches, Part 2: Manhattan's St. Stephen of Hungary. Visit "To face whatever lies before us...": New York City disasters and the prayers of young mothers for a look at a tragic event that occurred in their neighborhood in 1911. 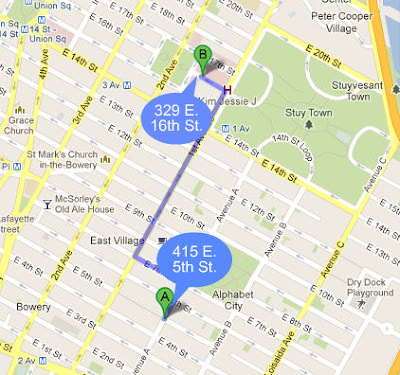 This map shows where the Ujlaky family resided at the time of the 1910 U.S. census (A) and the 1915 New York state census (B). They would remain living on E. 16th St. (although they moved to 431) until 1921. 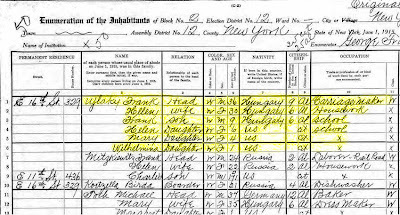 The 1910 U.S. census shows the Ujlaky (misspelled Ujlakei) family of three living at 415 E. 5th Street. They are already using their Americanized first names. Young Frank is listed as four years old. Frank senior works as a "wheelright" in a "wagon house". 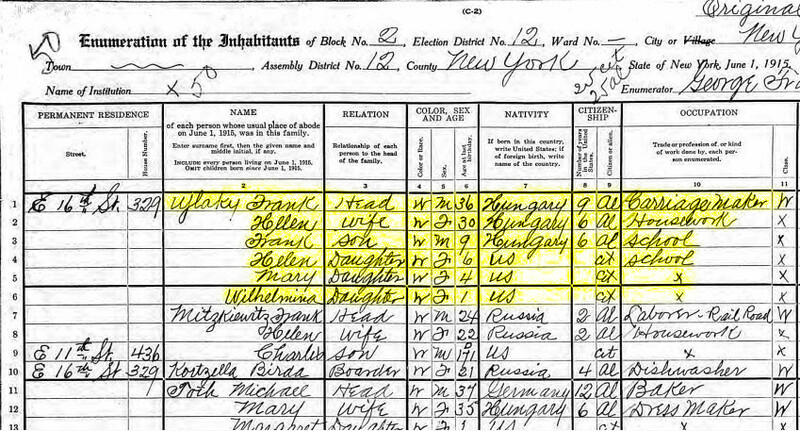 By December of 1913 the family had added three sisters and had moved north to 329 E. 16th Street, as shown in the 1915 New York state census below. Frank works as a "carriage maker". The closest photograph to January 1913 that I have of my great-grandparents is probably this wedding portrait. The bride Maria Gaspar is the cousin of my great-grandmother Ilona (now called Helen). Maria's wedding to Peter Gres must have been a beautiful celebration. My great-grandparents are seated and their two oldest children, Helene and Frankie, are standing at their sides. Someone else must have been holding baby Mitzi because she would definitely be born at the time of this wedding, but she does not appear in the portrait. My great-grandmother is either expecting or soon-to-be expecting her fourth child and third daughter Wilma. Labels: Ferencz Ujlaki (1), Ilona (Bence) Ujlaki, Manhattan, Where was my family? Thanks very much for the honor, Magda! Thanks again for reading and commenting. 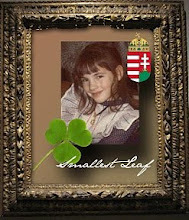 I enjoy your genealogy blogs, too.